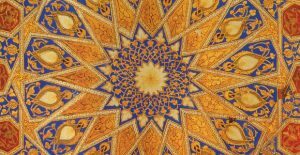 What is the Blessed Hilye Sharif (Hilya Sharif)? How does one describe the indescribable? How does one form an image of that which cannot be portrayed? That is what the hilye does — it gives parameters to the imagination so that one can think about the Prophet with a mental or spiritual image to hang onto, yet not attempt to visualize him or portray him in a painting. But the hilye is not an icon in words. As impressive and accurate as the many hilye texts are, they still remain vague, contrary to the claims of literalists, who would reject these texts as being visual portraits. That, of course, would not be acceptable to Muslims. Hilye is the Turkish form of the Arabic word hilya, which has several meanings, including physiognomy, natural disposition, likeness, depiction, characterization, and description. But these dictionary definitions only begin to convey the real meaning of the hilye, which embodies the Prophet’s moral, behavioral, and spiritual qualities as well as physical appearance. Like most Arabic words, hilya carries multiple overtones, making it difficult to translate. It has connotations of ornament, beauty, finery, and embellishment. I like to think of a hilya as a beautiful and significant description. He was not too tall nor too short. He was medium sized. His hair was not short and curly, nor was it lank, but in between. His face was not narrow, nor was it fully round, but there was a roundness to it. His skin was white. His eyes were black. He had long eyelashes. He was big-boned and had wide shoulders. He had no body hair except in the middle of his chest. He had thick hands and feet. When he walked, he walked inclined, as if descending a slope. When he looked at someone, he looked at them in full face. Between his shoulders was the seal of prophecy, the sign that he was the last of the prophets. He was the most generous-hearted of men, the most truthful of them in speech, the most mild-tempered of them, and the noblest of them in lineage. Whoever saw him unexpectedly was in awe of him. And whoever associated with him familiarly, loved him. Anyone who would describe him would say, I never saw, before him or after him, the like of him. Peace be upon him. 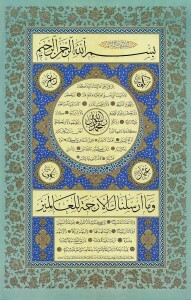 ‘The Prophet of God, peace be upon him, was of mighty significance to God, and profoundly honored among the people. His face radiated light like the moon on its fullest night. He was a bit taller than the medium stature and a bit shorter than the tall and skinny. His head was large. His hair was wavy. If his hair parted, he would leave it parted, if not he would leave it, and it would not be long enough to pass his earlobes. His complexion was fair. He had a wide forehead, arched, thick eyebrows with a space between them. There was a vein between them that would swell and pulse when he was angry. His nose was aquiline; it had a brightness about the upper part that led those who were less observant to think him haughty. He had a thick beard. His eyes were very black and the whites very white. His cheeks were not prominent, he had a wide mouth. His teeth were white and there was a space between his front teeth. Al-Hasan said, ‘I kept this report to myself, away from [my brother] Al-Husayn for awhile, then I told it to him, but he had already heard it and found out even more. He had asked our father [Ali] about the way the Prophet of God, peace be upon him, was at home, when he went out in his assemblies, and about his way of living.’ Al-Hasan left nothing of this out. ‘The Prophet of God, peace and blessings upon him, would hold his tongue except in matters which concerned his companions. He would encourage affection and concord between them and would say nothing to alienate one from another. He honored the nobles of every people who would come to him and make them their leaders. He would be wary around some people and on his guard against them [especially nomads], but he would never withhold from anyone his open-faced friendliness and fine personality. He would ask his companions about their situations, and he would ask people about what was going on amongst them. He would approve of that which was good and advocate it, and he would denounce that which was base and discourage it. ‘The Prophet of God, peace be upon him, did not sit down or stand up without mentioning God, nor did he reserve for himself fixed places among the people to be seated, and he forbade others also to reserve places for themselves [especially in mosques and public gatherings]. When he would go to visit a group, he would sit in the nearest available spot, and ordered that others follow this practice. He would give those seated near him his full share of attention in such a way that no one would think others had been given precedence over him. Whenever someone he would be sitting with would tell him of his needs, he would bear with that person until that person left him. When someone would ask him to solve a problem, he would not turn him away without solving it for him, if possible, or saying a comforting word or a prayer for its fulfillment. His cheerfulness and open personality were felt by all the people, and he became like a father to them. They came to have the right of mercy and compassion from him, as they were close, like the relation of parent and child, distinguished only by virtue and devotion to God. And in another narrative, they became equals regarding their rights in his eyes. The description is finished, with thanks and praise to God for His aid. He said, “Yes, certainly. By God, he was described in the Torah in some ways as in the Quran, ‘O Prophet, we have sent you as a witness, a bringer of good tidings, and a warner’ and as a protector of the weak. You are my servant and prophet. I have named you The One Who Relies. “He was not crude, nor was he coarse, nor was he one to shout and make a lot of noise in the marketplace. He did not answer an evil deed with another, but he would pardon and forgive. He would not be taken by God until he had straightened out the crooked people, until they would confess there was no divinity but God, and open blind eyes and deaf ears and closed hearts. O God, grant mercy and peace to our master Muhammad and his family. 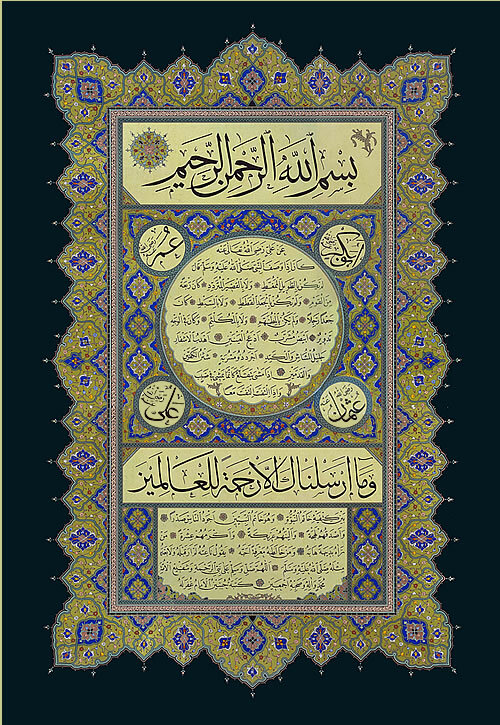 For a detailed exposition of the noble hilye, please refer to the excellent article entitled, “The Hilye of the Prophet Muhammad” by the renowned American calligrapher Mohamed Zakariya.